As parents, we are taught to look at measurements to determine if our child is healthy or not. From the moment they are born and every well-check appointment thereafter, we are told what percentile they are in, how they are growing, etc. We are told what foods to feed our children to help them grow healthy and strong, why they need to eat more vegetables, and why they shouldn’t eat fast food or too much sugar. As parents, we are trained to evaluate our child’s health by their stature, by the size of their body and what they are eating. But there is a flaw in this way of thinking, as this perspective on health over looks one crucial thing: the feeding relationship. What is the feeding relationship, and what does this have to do with our child’s health? Our child’s health is made up of many factors, most important being the feeding relationship between ourselves and our children. The feeding relationship involves the dynamics in how we are feeding our children and the resulting relationship. Did you know there are many different types of approaches to how we can feed our children? Did you also know that certain feeding styles can be more effective than others in raising a healthy eater who loves their body and has a good relationship with food? In fact, the feeding relationship between a parent and their child is more consequential in health-building behaviors than any type of food your child might eat. This means, you are more likely to have a child that grows up to be physically, emotionally, and mentally healthier if there is a positive feeding relationship, not necessarily because you took all precautions to ensure your child ate so many servings of fruits and vegetables, stayed away from sugar, etc. Research has found that parental feeding strategies are one of the most influential factors on a child’s eating habits, food intake, as well as the child’s weight status. Taking a closer look at the way we feed our children and the overall feeding relationship can give us a better picture of the health of our children. This can also help us identify ways in which we can better raise children who have a good relationship with food and their bodies. How have I affected the feeding relationship I have with my child? Like any relationship, we can easily carry past baggage or unresolved issues into the way we feed our kids. We may not always be aware of it, but past issues with food or insecurities with our bodies can come back to haunt us when it comes to our own feeding practices. When we feed our kids, sometimes our inner fears project and the urgency to control how and what our children eat becomes a dominant force in the feeding relationship. We may fear our child being unhealthy; we may worry about our child growing into a body size that is uncomfortable for them or for us. We may worry that food might harm them in some way, so we do the only thing we know how to keep them healthy - we exercise control in the feeding relationship. We might force them to eat vegetables because that is what we think is healthy or prevent them from eating sugar, but these tactics are stemmed from fear and create distrust and disruptions in the feeding relationship. Distrust in a feeding relationship teaches our children that food is not safe, that they are unable to trust their own bodies to self-regulate, or that they need to forcefully fight the body they were always meant to have. Many of these feeding strategies can stem from parents - both mother and father - who may feel insecure in their own bodies or who are unable to trust themselves with eating. This is often related to a past history of chronic dieting, disordered eating, bullying about body size, and more. 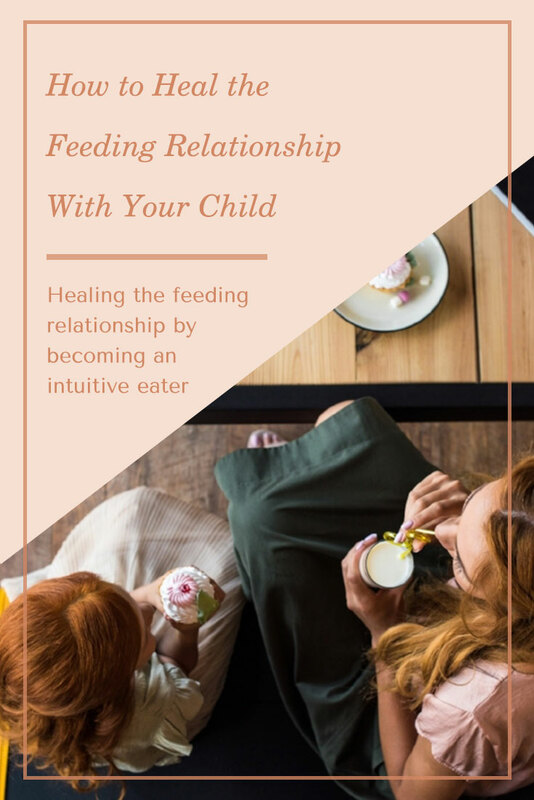 If you are worried about the feeding dynamics that you currently have with your child, know that you are not alone and that there is always hope for growth and healing. Having children, for me, was one of the single most, motivating factors to propel forward in my recovery from an eating disorder. I knew in order to raise children who were confident in their bodies and healthy eaters, that I needed to establish this for myself first. One of the first and most important steps in healing the feeding relationship with our children is to heal any past or unresolved issues with food and our bodies. For many mothers, this includes adopting a new shift in thinking about food and moving from a dieting, scarcity mindset with eating to one where all foods are neutral, acceptable, and safe for eating. This in turn, can help us approach feeding our children from a place of trust, security, and stability. In the long run, this can also help prevent our children from a host of complications as we nurture a positive feeding relationship. What does it mean to be a mother who eats intuitively? What exactly is intuitive eating, and how can a mom learn to eat intuitively? To eat intuitively means to learn to listen to and trust your body as a guide for how you eat rather than being dictated by dieting, diet rules, diet culture, etc. While this can seem oversimplified or even terrifying, it’s an acknowledgement that there is no “one right way for eating” and that YOU are the best expert of your body. It’s looking at health from a self-compassionate lens with the understanding that kindness toward ourselves and our bodies is what cultivates a true sense of wellness. So what might this mean for you, mama? Practicing these types of behaviors can heal a scarcity mindset toward food, where feeding disruptions with our children can ensue. 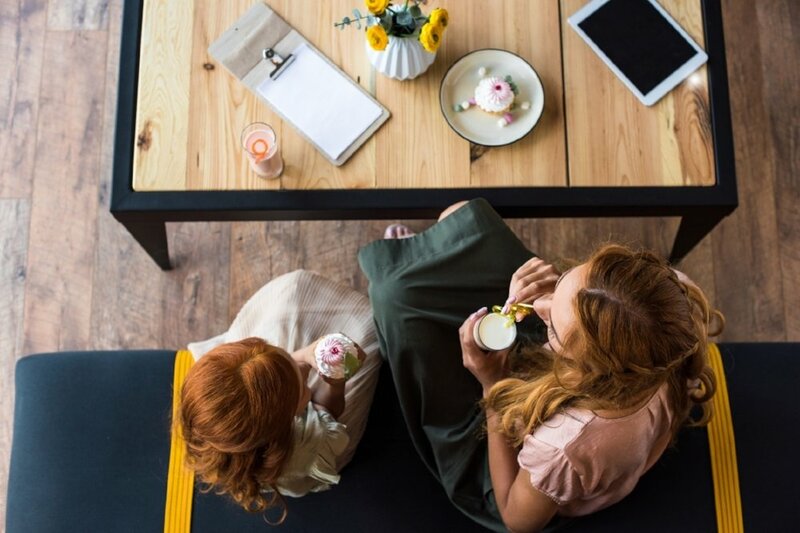 As mothers, when we take the steps toward healing our relationship with food and work on health promoting behaviors, regardless of weight, we are creating space to nurture the ways we feed our own children and approach their health. Teaching the intuitive eating concepts to our children and raising a confident, healthy eater is based on our ability to do the same. No matter what your journey has been, mama, or where you are today, you have the capacity to develop a positive feeding relationship between you and your child; one from which their own body confidence and well-being will flourish.